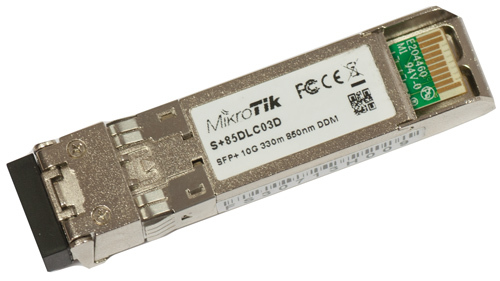 Mikrotik brand MM 850nm 10G SFP+ enhanced multi-mode fiber Module with dual LC-type connector and DDM. The enhanced small form-factor pluggable (SFP+) is an enhanced version of the SFP that supports data rates up to 10 Gbit/s. Operates on multi-mode fiber-optic link spans of up to 300 meters. Now with DDM support. Standard 10G SFP transceiver that is within the SFF Committee specifications for SFP+ Transceivers. Tested and compatible with CCR1036-8G-2S+ and CCR1036-8G-2S+EM. Compatible with non-MikroTik SFP+ devices as well.